On behalf of the Board of management of the Netherlands China Business Council, of which I am the Vice chairman, I would like to express our heartfelt congratulations to Yili Group, to Mr. Gerrit Smit and his team with the establishment of the Yili Innovation Center Europe, here in Wageningen. The fact that Yili Group has chosen Wageningen University – the number one Agricultural University in the world – to set up a research and development center, underlines the fact how much importance is attached by Yili to cooperate with a widely regarded top Dairy Campus and R&D institution. Out of the top 40 food and drinks companies in the world, 12 have R&D centers in the Netherlands. Food safety and food quality management are definitely the strengths of the Dutch food chain. The Netherlands is a dairy country. The dairy sector is one of the most important engines of the Dutch economy. Our climate and soil are ideal for grass and dairy cows. The Netherlands has a long tradition in the production of milk, yoghurt, butter and cheese. The strong internationally oriented business model we see in dairy today has been built over more than 150 years. The “Sustainable Dairy Chain”, a coalition between dairy companies and dairy farmers who work together towards a dairy sector that strives to achieve climate neutrality, continuous improvements in livestock health and welfare, preservation of grazing, and protecting biodiversity and the environment. Every year, the independent Wageningen Economic Research publishes a sector report to monitor progress with regard to the realization of the stated goals, with special attention to quality control. It is understood that one of the main reasons this center has been established is to achieve a perfect product to market fit in China. 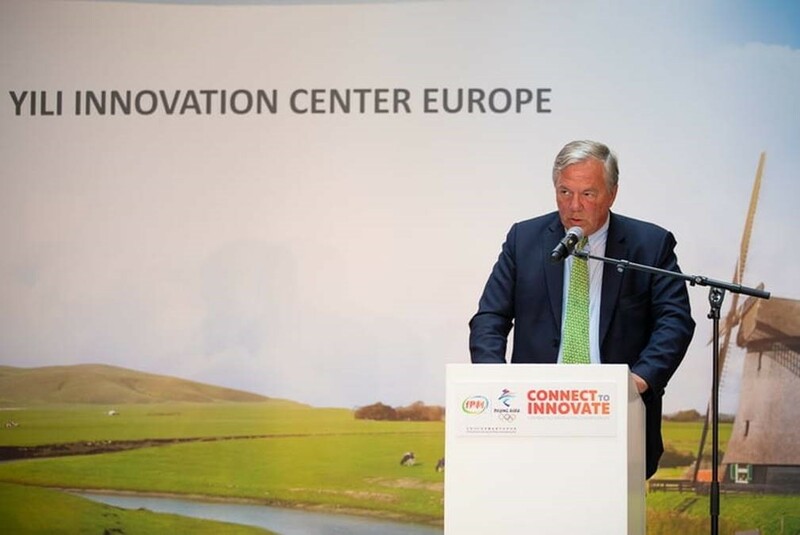 I wish the people working at the Yili Innovation Center Europe office, the best of success in working together with their Chinese colleagues, in bridging the cultural differences between the Chinese and European minds and markets, and in developing innovative products that fit the Chinese taste and will improve the health of the people. All this will undoubtedly increase the market share of innovative dairy products in China ! If there is anything where we, as NCBC can be of assistance, please feel free to contact us.